As a girl who used to turn her nose up at Mexican food, I’m a million miles away from where I started. One of my very favorite things to order at a Mexican restaurant is chile rellenos. A pepper that’s been stuffed with potato and cheese, then fried? Sign me up. Now that summer is upon us, and in another month or so I’ll be picking a basket full of poblano peppers every couple of days, I figured it was only prudent to buckle down and come up with my ideal relleno recipe. 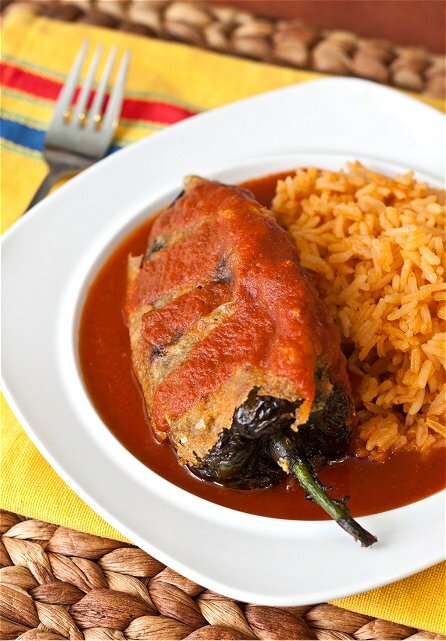 A big misconception is that chile rellenos are super spicy. Not the case, so don’t let the word “chile” scare you off. We don’t mind a little heat, but if you’d like them even milder – just remove all of the seeds from inside the pepper before filling. I fried this batch to keep it authentic, but often I skip the batter entirely and just stick the stuffed peppers under the broiler for a few minutes. Shaves some time and calories, which is always a good thing! When paired with some Spanish rice, these make a delicious and satisfying summer meal. Enjoy! Bring a small saucepan of water to a boil. Add the potatoes and cook until fork tender, about 15 minutes. Drain thoroughly, place in a large bowl, and set aside. To make the sauce; combine the onion, oil, and 1/2 teaspoon salt in a large saucepan. Cover and cook over medium-low heat, stirring often, until the onions have softened, 8 to 10 minutes. Stir in the garlic, chili powder, and cumin; cook until fragrant, about 30 seconds. Stir in the tomato sauce and chicken stock, bring to a simmer, and cook until thickened, about 10 minutes. Remove from heat, and strain sauce through a fine mesh strainer. Set aside. Make a slit down one side of each pepper. Place them in a dry skillet over medium heat, turning them frequently until the skins blister. Place the chiles in a Ziploc bag and seal closed to steam peppers. Set aside for 20 minutes, then carefully peel off the skins and remove the seeds, if desired, keeping the chiles whole. Dry the chiles with paper towels and set them aside. Put the cream cheese and shredded cheese in the bowl with the potatoes. Add salt and pepper, and mix to combine. Spoon some of the potato filling into each chile, and squeeze it back closed. In a standing mixer fitted with a whisk attachment, whisk the egg whites to firm peaks. In a separate bowl, whisk the egg yolks until pale, then fold in the egg whites. Scrape the mixture onto a large, shallow dish. Place the flour in another shallow dish and season it with salt. Add 1/2″ oil to a heavy bottomed skillet and heat to 375. Coat a few chiles first in flour and then in egg before adding carefully to the hot oil. Fry the chiles in batches until golden and crisp. Drain on paper towels. Serve on a bed of chile sauce, with some sauce drizzled on top as well. I can’t say that I ever disliked Mexican food, but I have most certainly expanded my palate from my once standard-no-matter-what-Mexican-Restaurant-I-am-at Chicken Enchilada order. Just in the past few years I discovered my love for Chile Rellenos and Tamales. Oh, how I love both of them! This looks like a great recipe to have in my arsenal! Oh this sounds wonderful, I have a ton of poblanos recently given to me and was thinking of new ways to use them up. Great timing on your recipe, thanks. I love chile rellenos so much, though I’ve never had one with potato! I almost always order a “combo” plate at the authentic Mexican place of chile relleno + carne asada. Mmm. I love chili rellenos, but I’m not a big cream cheese fan…I might try to leave it out and see how it turns out…. I haven’t had a Chile Relleno in years but your filling sounds so tempting, what’ not to like about Potatoes, Cream Cheese, and Monterrey Jack Cheese!!!! Thank you for sharing this CLASSIC MEXICAN RECIPE!!! I am making this right now. I noticed a couple of errors. The ingredient list says chili pepper and chick stock. The method says add chili powder and water. I am going with the chili pepper and stock, hope that is right.